Brewers infielder Mike Moustakas will try to play through a fracture in the tip of his right ring finger, and is hopeful of avoiding an injured list stint. (Todd Rosiak of Milwaukee Journal Sentinal was among those to report the news.) Moustakas suffered the injury yesterday while fielding a ground ball and left the game after the sixth inning. X-rays were negative, though Moustakas isn’t in the Brewers’ lineup today. The third baseman-turned-second baseman has received mixed reviews at his new position depending on which defensive metric you prefer — the Moose has a +3.9 UZR/150 but minus-2 Defensive Runs Saved over 137 1/3 innings as a second baseman this season. No matter the position, Moustakas has continued to hit, with six homers and a .239/.349/.549 slash line through 83 plate appearances. Pirates manager Clint Hurdle and GM Neal Huntington updated the media (including Bill Brink of the Pittsburgh Post-Gazette) on the status of several injured Bucs players. A collision between Starling Marte and Erik Gonzalez during Friday’s sent both men to the injured list, with Gonzalez on the 60-day IL with a broken collarbone and Marte to the 10-day IL with abdominal wall and quadriceps bruises. While Marte has the shorter timeline on paper, Huntington wasn’t certain when Marte could be back in action. Corey Dickerson isn’t yet ready for a minor league rehab assignment as he recovers from a shoulder strain, while Gregory Polanco (labrum surgery) could potentially make his season debut sometime this week. In other Pirates injury news, the team placed catcher Jacob Stallings on the 10-day IL with a cervical neck strain. Stallings’ roster spot will be filled by Einar Diaz, who was activated off the IL after recovering from a virus that sidelined him for two weeks’ worth of Spring Training action. Top Reds prospect Nick Senzel is scheduled to play in his first Triple-A game of the season on Tuesday, Bobby Nightengale of the Cincinnati Enquirer writes. Senzel was sidelined late in Spring Training with an ankle injury, so it will end up being roughly a month-long absence for the infielder-turned-center fielder. Senzel has already been playing some extended Spring Training games, and will now return to Triple-A Louisville after posting an .887 OPS in 193 PA at the top minor league level in 2018. The Reds are expected to promote Senzel at some point this season, though they’ll first want to see the 23-year-old get an extended stretch of good health, as Senzel has been plagued by a variety of injuries over the last year. The Brewers will press ahead with their unconventional plan for Mike Moustakas. Skipper Craig Counsell says the long-time third baseman will indeed line up at second base in Milwaukee, as Tom Haudricourt of the Milwaukee Journal-Sentinel was among those to tweet. The move from the hot corner to second isn’t particularly common. And it’s all but unprecedented for a player to be handed the keys to an up-the-middle defensive position that he has never before played professionally. (Moustakas does have minimal experience at shortstop dating to his first two seasons as a pro.) The Brewers obviously feel the tools are there to allow Moustakas to succeed — once he has been positioned optimally, at least. Royals reliever Brad Boxberger was kept out of spring action with an unspecified leg issue, Lynn Worthy of the Kansas City Star reports (Twitter link). Manager Ned Yost would say only that the hurler had “tweaked” something. Fortunately, Boxberger was able to get back on the bump last night and now seems on track to be ready for the start of the season. Boxberger, who is earning $2.2MM on a one-year deal with the Royals, has been expected to serve as his new club’s closer. The Reds trotted out Michael Lorenzen as a two-way player in Cactus League action today, as MLB.com’s Mark Sheldon writes. Dual deployment has long been anticipated, though it was — and remains — unclear how frequent he’ll be called upon to line up in the outfield. Lorenzen was in center field today. The 27-year-old hit a robust .290/.333/.710 with four home runs in 34 plate appearances last year, so it’s understandable that the club would like to see what he can do with more opportunities. Baseball decisions can be tough to understand at times. Cameron Rupp’s recent history presents a bit of a puzzle, as Chris McCosky of the Detroit News explores. The Tigers’ newly added backstop played in at least half of the Phillies games annually from 2015 through 2017, producing just-below-average, power-driven offense. Rupp’s framing fell apart in 2017, but he had been a decent performer in that metric previously and otherwise was not a problem behind the dish. Despite being relatively youthful and continuing to turn in solid work at the plate, though, Rupp never got a call to the big leagues last year and is already on to his second organization this spring. An earlier version of this post mistakenly indicated that Boxberger had not yet returned to game action. Though the Cardinals have a deep mix of rotation candidates, Bernie Miklasz of The Athletic explores the uncertainty surrounding many of those arms in a call for the St. Louis organization to pursue free-agent lefty Dallas Keuchel (subscription required). The Cards can’t know what to expect from Adam Wainwright, Miklasz writes, and the recent shoulder troubles for Carlos Martinez have raised some questions as well. Michael Wacha, too, has had his share of injuries in recent seasons and made only 15 starts in 2018. And while ballyhooed prospect Alex Reyes has a sky-high ceiling, he’s pitched just four innings across the past two seasons (27 frames, including the minors) and will obviously be limited in ’19 as a result. Jack Flaherty and Miles Mikolas each have just one season of MLB success under their belt, and the depth options for the rotation are even less established. Furthermore, each of Mikolas, Wacha and Wainwright are free agents next winter, creating some potential needs down the line. Miklasz does write, however, that the Cardinals are “confident” of reaching an extension with Mikolas. Both sides expressed interest in such a deal late last month. Because the Reds have yet to add a true center field option to the roster, Scott Schebler is among the top options to break camp in that role, writes Mark Sheldon of MLB.com. The 28-year-old does have a nominal amount of experience at the position, having logged a combined 358 innings there across the past three seasons. “I’m interested to see him in center,” rookie manager David Bell said to Sheldon. “Everyone I’ve talked to that has seen him, people are confident that he can do it. I am, too, but it’ll be a good opportunity to see him out there. I’m convinced he can be really good in left and right.” Schebler will have some competition for the center field gig in the form of Yasiel Puig and top prospect Nick Senzel, though Senzel played in only 44 games last season due to a fractured finger and vertigo symptoms; he was also forced to sit out the Arizona Fall League after undergoing elbow surgery. Cole Hamels’ return to the Cubs all but eliminated Mike Montgomery’s chances of opening the season in the team’s rotation, but Montgomery nonetheless tells MLB.com’s Jordan Bastian that he was “rooting” for the team to retain Hamels. Montgomery will return to a role with which he’s quite familiar — one that requires him to be ready to start, pitch in high-leverage spots late in games and also to enter in multi-inning stints as needed. “Be a guy that can start 20 games or close 20 games, because it has to be [that way],” said Montgomery. As Bastian notes, Montgomery not only started 19 games in Chicago last season, he also entered the game in eight different innings as a reliever and pitched multiple innings of relief on seven occasions. The versatile lefty is controlled through the 2021 season and will earn $2.44MM in 2019 as a first-time arbitration-eligible player. The Brewers and free-agent third baseman Mike Moustakas have officially agreed to a one-year agreement. The Boras Corporation client will reportedly earn $10MM on the deal, which includes a $7MM salary in 2019 and $3MM buyout on a $11MM mutual option for 2020. The 30-year-old Moustakas’ deal with the Brewers means he’ll wrap up a second straight lengthy stay in free-agent limbo. He first reached the open market last offseason and ended up going without a job until early March, when the Royals re-signed him to a contract worth a guaranteed $6.5MM. Kansas City was no doubt hoping to contend at the time, but it ended up as a bottom-feeding team, leading it to send Moustakas to Milwaukee in advance of the July trade deadline. As a Brewer, Moustakas hit .256/.326/.441, right in line with the .249/.309/.468 line he posted as a Royal last year. All told, Moustakas smacked 28 home runs, logged a 105 wRC+ and registered 2.4 fWAR over 635 trips to the plate. Since his 2011 major league debut with the Royals, Moustakas has almost exclusively played third base, where he has accounted for nine runs saved and a plus-15.1 Ultimate Zone Rating. The hot corner is also the home of slugger Travis Shaw, who bumped over to second for the first time last season on the heels of the Moustakas acquisition. Now, the plan is for Moustakas to get a run at second base this spring, with the organization continuing to rely upon defensive positioning to help shoehorn both power hitters into the same unit. With those two, Jesus Aguilar at first base and Orlando Arcia at shortstop, the Brewers look to have a strong starting infield in place after falling just one win shy of reaching the World Series in 2018. The Moustakas re-signing is the second major move for Milwaukee since last season ended. The club previously signed catcher Yasmani Grandal to a one-year contract, and with him and Moustakas in the fold for a full year, the Brewers may be serious NL contenders once again. The club finished seventh in the majors in position player fWAR last season despite receiving subpar production at second, where Shaw should take over in the wake of the Moustakas deal, and behind the plate. Of course, it’s up in the air whether the Brewers will be able to survive a second straight year without anything resembling a front-line starter, unless one of their in-house hurlers bursts on the scene. Ken Rosenthal of The Athletic reported the signing. Bob Nightengale of USA Today had the salary, while Mark Feinsand of MLB.com and Bob Nightengale of USA Today added the mutual option details. When word of Mike Moustakas’ impending return to the Brewers broke, the assumption among many was that the Milwaukee organization would utilize the same defensive alignment as in 2019: Travis Shaw shifting over to second base and Moustakas handling third base. However, Tom Haudricourt of the Milwaukee Journal-Sentinel tweets that the Brewers will use Spring Training to determine if Moustakas is able to handle second base. If the team is satisfied with what it sees, Moustakas will be the primary second baseman, with Shaw remaining at third base. While the arrangement likely isn’t one that many would anticipate, it does have the potential to be the best of their options. Shaw, after all, has turned in quite strong defensive marks at the hot corner since coming to Milwaukee, recording 22 Defensive Runs Saved and a +3.5 Ultimate Zone Rating across the past few seasons. Moustakas, meanwhile, has been average or slightly better for most of the past four seasons (with his return year from surgery to repair an ACL tear standing out as an understandable exception). If Moustakas is able to play even competently at second base, the Brewers could enjoy the benefit of retaining a plus defender at the hot corner. Of course, if the experiment doesn’t yield dividends, there’ll be a fair bit of second-guessing as to why the Brewers didn’t simply acquire a truer option at second base. The market certainly had — and still has — alternatives. 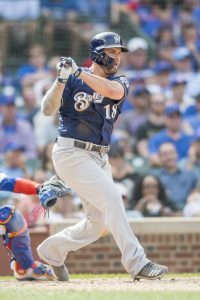 Marwin Gonzalez, Josh Harrison and Logan Forsythe are among the currently available players, and it’s worth pointing out that the Brewers were seemingly willing to pay more to play Moustakas out of position than they’d have needed to pay to simply sign Brian Dozier, who went to the Nationals for one year and $9MM. Of course, the 30-year-old Moustakas is coming off of his fourth-straight season of above-average offensive work, with his consistent power making up for less-than-certain on-base numbers. And the Brewers know well what they are getting, having seen Moustakas up close down the stretch in 2018. In any event, it’ll be fascinating to see how the experiment pans out. Philadelphia has been chasing free agent Manny Machado for months, but if the team doesn’t sign him, it appears it’ll go forward with Maikel Franco and Scott Kingery at third base. The Phillies “seem cool” on the possibility of signing Mike Moustakas or another non-Machado free agent to man the position, Todd Zolecki of MLB.com writes. The club’s of the belief that Franco and Kingery are “two really good options,” according to general manager Matt Klentak. The 26-year-old Franco wasn’t much different offensively than Moustakas in 2018, though the latter trumped the former as a defender. Kingery had a disastrous rookie season at the plate, but the Phillies remain high on the 24-year-old, whom they signed to a long-term deal last March before he ever accrued a major league at-bat. Red Sox designated hitter J.D. Martinez is only a year removed from a protracted trip to free agency – one that culminated in late February with a five-year, $110MM guarantee. While the open market has frustrated many players over the past 16 months, Martinez may head back to free agency as early as next winter if he opts out of his contract after the season. The 31-year-old said Sunday that the cases of still-unemployed superstars Machado and Bryce Harper won’t play much of a role in his forthcoming decision, per Christopher Smith of MassLive.com. “At the end of the day, I know my value and I know what I bring to the table,” said Martinez – who, like Harper, is a Scott Boras client. “I really don’t look at that. I really judge me on me.” Regardless of whether Martinez does vacate his current contract next offseason, the offensive dynamo noted he’d “love” to continue his career in Boston, which he helped lead to a World Series title in 2018. First baseman Peter Alonso, MLB.com’s 51st-ranked prospect, may be able to help the Mets as early as Opening Day, though whether he’ll make the team’s roster is in question. The Mets would gain an extra year of control over Alonso, 24, by keeping him in the minors until at least mid-April, after all. However, New York – led by general manager Brodie Van Wagenen – insists having seven years of control over Alonso instead of six won’t factor into whether he cracks its season-opening roster in 2019, Anthony DiComo of MLB.com relays. “Our management’s going to fight for [Alonso],” said manager Mickey Callaway. “I think Brodie’s made it clear that he’s a players’ guy. And if he deserves it, he’s going to be on the team.” The main player standing in Alonso’s way appears to be Todd Frazier – the Mets’ projected starter at first – but the 33-year-old is coming off a poor year. Alonso, on the other hand, was highly productive in Double-A and Triple-A stints last season. The Angels are among a handful of teams in on free-agent third baseman Mike Moustakas, joining the previously reported Brewers-Padres-Phillies trio, Heyman tweets. This is the second straight offseason in which the Angels have shown interest in Moustakas, a Los Angeles native who, per Sam Mellinger of the Kansas City Star, turned down a three-year, $45MM offer from the Halos last winter. Agent Scott Boras denied that, but regardless, Moustakas ended up settling for a one-year, $6.5MM guarantee to re-sign with the Royals. The 30-year-old then went on to post a typically decent season (105 wRC+, 2.1 fWAR in 635 plate appearances) divided between KC and Milwaukee. Now, if Moustakas joins the Angels, he’d presumably be the favorite to start at third for the club. His presence would likely push Zack Cozart to second base, thus sending David Fletcher to the bench, but given that Moustakas is a lefty and Cozart a righty, the two could perhaps platoon at third. When Atlanta was pursuing catcher J.T. Realmuto, whom Miami has since traded to Philadelphia, Braves infielder Johan Camargo drew the Marlins’ interest, Heyman reports. The Braves continue to view Camargo as a key piece, however, despite the one-year, $23MM deal they struck with third baseman Josh Donaldson earlier this offseason. Camargo is coming off a terrific 2018, which he spent at third and posted 3.3 fWAR with a .272/.349/.457 line and 19 home runs in 524 plate appearances. Though Camargo doesn’t have a set position heading into the new season, the 25-year-old should see plenty of action nonetheless. Adding to his appeal, Camargo’s controllable for the next half-decade, including one more pre-arbitration season. Back to the Angels, who targeted catcher Wilson Ramos before he signed with the Mets in free agency on a two-year, $19MM contract. It turns out that the Angels offered Ramos a “similar” deal before he chose the Mets, Heyman relays. After losing out on Ramos, the Angels made a less exciting pickup, signing Jonathan Lucroy to a one-year, $3.35MM pact. They’re left to hope the combination of Lucroy, Kevan Smith and Jose Briceno – the only catchers on their 40-man roster – will hold their own in 2019.